How do I enter and edit grades in the New Gradebook? 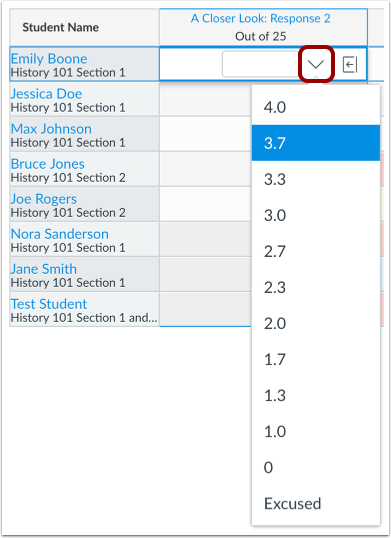 Most likely you will access SpeedGrader to enter grades. The grades will appear in the Gradebook when you are done. However, you can manually enter and edit grades in the Gradebook. Assignments in the Gradebook are always shown with the assignment's point value. However, you can change the assignment to display grades for a specific grading type. You can also use a CSV file to import grades. 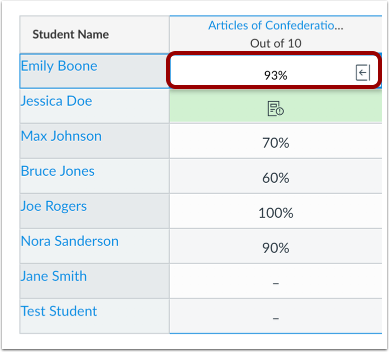 When using differentiated assignments, the assignment appears as a column for all students, but grade cells are grayed out for students who are not part of the assignment or an assigned section. Grades cannot be assigned to students who are not part of the assignment or section; those assignments are not factored into overall grades. Once a student receives a grade for an assignment, the grade will always apply to the student's current and final grade. If you unassign a student or section to a differentiated assignment you have previously graded, the grade will only be removed from grading calculations if you excuse the assignment for the student. 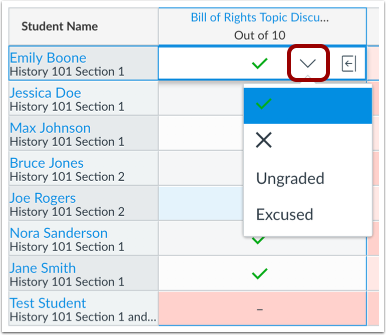 When Multiple Grading Periods are enabled in a course, you cannot edit grades for any assignment that has at least one student in a closed grading period. The Gradebook History page records all grade changes in the Gradebook and can be accessed at any time. 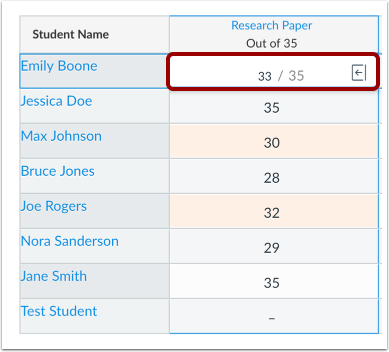 Locate the student name and assignment where you want to enter a grade. 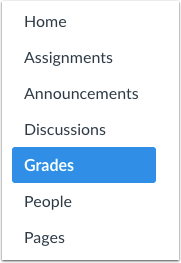 Grades are entered according to the assignment's Display Grade setting. Grades can be entered as one of five options: points, complete/incomplete, letter grade, percentage, and GPA. 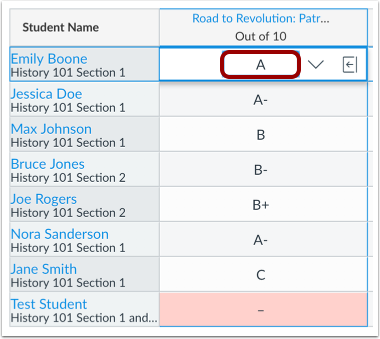 You can change the assignment to display grades for a specific grading type. Note: When you reach the end of a column, pressing the Return or Enter key advances to the top of the next column. To enter a points grade, enter the number of points in the cell and press the Return key (on a MAC keyboard) or the Enter key (on a PC keyboard). 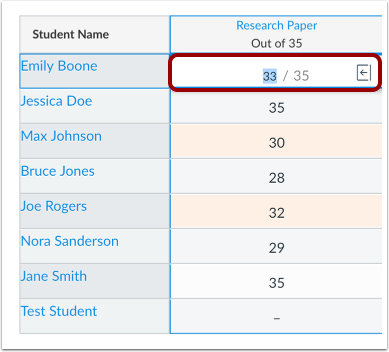 To enter a complete or incomplete grade, click the drop-down menu in the cell and select the desired icon. Grading options include complete, incomplete, ungraded, and excused. Click the drop-down menu and select a letter grade from the menu. You can also manually enter a letter grade. Enter the letter which corresponds to the letter scale defined by the grading scheme and press the Return key (on a MAC keyboard) or the Enter key (on a PC keyboard). If you enter a letter grade that is not supported in the grading scheme, the cell displays an invalid grade warning icon. Canvas will also display an invalid grade warning message. To enter a percentage grade, enter the percent in the cell and press the Return key (on a MAC keyboard) or the Enter key (on a PC keyboard). To enter a GPA grade, click the drop-down menu and select the desired grade from the menu. You can also enter the number which corresponds to the GPA scale defined by the grading scheme and press the Return key (on a MAC keyboard) or the Enter key (on a PC keyboard). To edit an existing grade in the Gradebook, click the assignment cell for the grade. To assign a new grade, enter the new grade. To delete the grade, click the Delete key. To apply the edited grade, press the Return key (on a MAC keyboard) or the Enter key (on a PC keyboard). 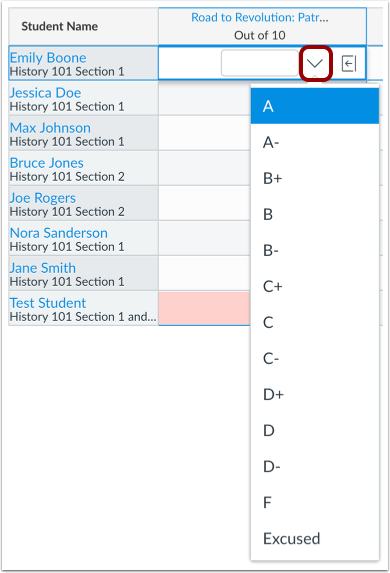 Grades can also be entered in the Grade Detail Tray according to the assignment's display grade setting. 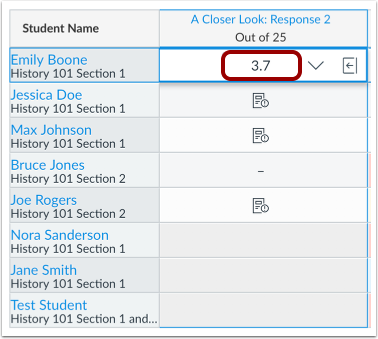 To open the tray, click an assignment cell for a student and click the Grade Detail Tray icon . In the Grade field , enter the grade for the student. To advance to the next student, click the arrow icon . 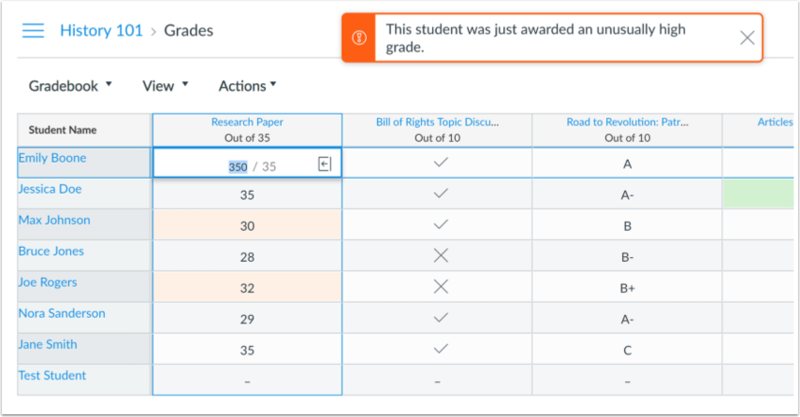 If an excessive amount of points is added to a student's grade, Canvas will generate an alert notifying that the student was awarded an unusually high grade. You can either keep or correct the point value. Previous Topic:How do I upload all student submissions for an assignment in the New Gradebook? Next Topic:How do I enter grades for an individual assignment as a specific grading type in the New Gradebook? Table of Contents > New Gradebook > How do I enter and edit grades in the New Gradebook? 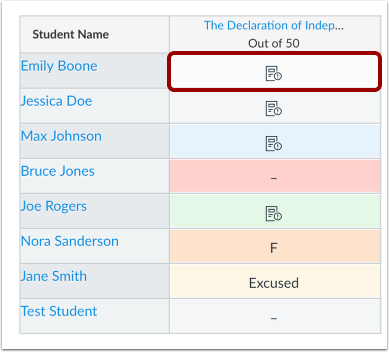 How do I upload all student submissions for an assignment in the New Gradebook?